Okay, I know this is a somewhat controversial pairing among Trekkies. But I find their relationship truly inspiring and, especially in the DS9 episode “Change of Heart,” quite moving. Come on, admit it. If you love Star Trek, it has made you cry at least once. Kirk’s speech at the end of Wrath of Kahn, TNG‘s series finale, the fact that you paid good money to see Star Trek: Insurrection – somewhere along the way, you’ve teared up over Trek. For me, though, DS9 has been waterworks central. Maybe it’s because I have a wife and son now and so many of the series’ episodes deal with family relationships. Maybe it’s because of the stage of my life that I’m in. Maybe it’s because I tend to watch these episodes in the small hours of the morning. For whatever reason, Deep Space Nine has been more emotionally powerful for me than any other Star Trek series so far. The most recent opening of the floodgates was the great Jadzia/Worf episode “Change of Heart.” I’m sure I’ll have more to say on this in the future, but I’ve seen a lot of stories about one half of a romantic couple in danger of dying while the other must fight to save their lover’s life and this one was a cut above the usual. It’s not just the sweetness between the two–their humor and sparring and how well they work together blended with their obvious deep affection–it’s the circumstances and stakes of the story. Worf’s willingness to do whatever it took to save Jadzia, regardless of the cost or consequences, is so extraordinary and moving. In part, it is perhaps because it comes from one so disciplined and so rarely emotionally available that the depth of his commitment to Jadzia is so impressive, so compelling. For me, it reflected the depth of commitment involved in marriage and Paul’s admonition to men that they “love their wives as their own bodies.” Perhaps it’s too easy to think about dying for someone–especially if you expect to wake up in the manifest presence of God. Perhaps we sometimes overlook the power of the sacrifices we make that demand less of us and are somehow harder to imagine making. It’s one thing to die and leave the world behind. It’s far another to give up something precious that you will have to live without, to commit an act that will bring you harsh consequences or even alter the course of your life. As Jesus said, there is no greater love than laying down your life for someone else, but laying down your life is not just dying for someone. It’s living for them too. Deep Space Nine is very much about living with the consequences of our decisions and Worf’s decision in “Change of Heart” to value his wife’s life over possibly turning the tide of an interstellar war and saving billions of lives in the process is a decision with profound consequences. But, he’ll take Jadzia for who she is every time, over every available option. As he tells her early in the episode, “I would rather lose a bet on you than win one on someone else.” Indeed, he makes (according to Starfleet) the “wrong” choice. Worf, in effect, loses by betting on Jadzia. But, as he also says of losing that earlier bet, “It is of no consequence.” He’s won something greater than the prize he was after–the one whose heart beats with his. “Chane of Heart” made me think about my wife and son and the lengths I would go to for them. It reminded me of the depth of my commitment to them and the value of keeping that commitment just as I would fight to maintain my own breathing. Then, when I went and told my wife I’d just watched the most romantic episode of Star Trek ever, she looked at me incredulously and said, “They have those?” Being married to someone who would ask that question because she doesn’t like Star Trek may be a small sacrifice, but it’s one I’m willing to make. She may not get Star Trek, but I’d rather be married to my non-Trekkie wife than be married to a Trekkie who wasn’t her. I totally agree with you. 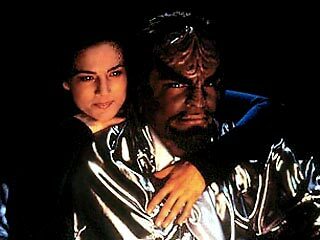 Worf/Jadzia is one of the best pairing in Star Trek. Their relationship is one of the most realistic, passionate, funny, sweet and romantic relationships in Star Trek. I love how deep their feelings are and how strong their bond is. They love each other uncoditionally! Change of Heart is my favorite DS9 episode (along with Looking for Par’mach in all the wrong places). Thank you!! It’s good to feel backed up on this one. I don’t understand the complaints people have about this relationship. Just in case a reader of this comment has not gone through DS9 yet. It’s just a shame that they, like EVERY other Star Trek couple, were doomed to be separated. Except, of course, for Miles and Keiko, who are just doomed to suffer terribly every time an episode focuses on them. Of course, the tragedy of “Change of Heart” is that it comes just a few episodes before we have to actually say goodbye to this couple. Jadzia’s line in “CoH” that it’s been a good two months is particularly heartbreaking when their relationship ends up ending after, what, maybe four months (depending on DS9′s elastic chronology)? So sad. Thanks for commenting! If you’d like to be on the UCP mailing list, you can sign up for the newsletter. What makes Warf’s and Jadzia’s relationship so remarkable is that they were the most unlikely pair! Jadzia didn’t deserve to die! their relationship may have been the most authentic relationship in the Trek universe, aside from Spock and Sovik (read Vulcan Heart). It was definitely one of the most compelling relationships, particularly among the romances. I loved how Jadzia would stand up and match Worf’s power and energy at every turn and challenged him to grow in new ways. He once referred to her as “the magnificent Jadzia Dax.” She was. Thank you. I believe Jadzia is a stronger character than Esri in part because we are only introduced to Esri in the last season. Ezri had so much potential. I really was unsure of her at first, mostly because I wasn’t sure of Nicole de Boer’s acting style, but by the end of Season 7, I wanted to see more. She was really cool. I still miss Jadzia, of course, but Ezri was a great way to expand the Dax character as only a Trill can be. Great post! Jadzia and Worf belong together! I was so upset with the writers for what they did to my favorite couple and to one of the best characters in DS9 that I did not watch season 7 at the time. I watched it several years later in one of my reviews but it still does not feel right. I just didn’t care for the series after Jadzia died. For me DS9 ends with season 6. I can totally understand that. I do think the exit of Robert Hewitt Wolfe from the writing staff likely had at least as much impact on Season 7 as Jadzia’s death, though. Season 7 was difficult for me in places, though largely due to the war stories. I had to warm up to Ezri as well, but I still enjoyed the season overall and wish I could have seen her character grow more. Thanks for commenting! If you haven’t yet, be sure to sign up for the mailing list. There’s lots more to come! Well, I feel that Deep Space 9 ended too abruptly anyway! There is so much room for further character development! Of course. Always! I wish the TNG films had taken greater advantage of the opportunity to develop its characters further in the films, as we’d all hope DS9 would have. But, more on DS9′s finale will be coming soon! Look forward to reading another excellent analysis! I think the TNG movies were pretty good particularly in developing Data’s and Picard’s characters– data and Picard in First contact and Insurrection. I thought Picard’s character became much more complex in Nimesis. Forcing one to confront himself is the most personal and difficult task in my view. Maybe this was the point in creating Picard’s foil, if that is what you want to call his clone..
Well, that’s a whole conversation right there. I felt that the Picard story was hurt by the casting situation (i.e. Tom Hardy being a great villain but an unconvincing visual match for a young Patrick Stewart) and because of that, his story fails to gain dramatic momentum for me in places where it should. But, the idea of the story is indeed powerful. Data’s story is stronger in both structure and execution, to my mind. Well, since i can’t see the characters visual elements of the story aren’t on my mind, but I think I also miss important elements as well. I never figured out how the Romulans used Picard’s data without his knowledge or without alerting Section 31 at the very least! Right! I forgot about that. A blessing in this case. As for getting Picard’s DNA, it’s no big deal. You just need something like a hair with a follicle from a hairbru…oh, wait. Smile, I always forget the obvious.